Azerbaijan is interested in attracting Polish investments in its economy and deepening business relations with the Central European country. The issue was high on agenda during 7-th gathering of the Azerbaijan-Poland Intergovernmental Commission on Economic Cooperation in Warsaw on December 19-20. Azerbaijan’s Energy Minister Natig Aliyev, addressing the event, invited Polish entrepreneurs to invest in Azerbaijan, and provided an insight into business and investment opportunities in the country. The minter outlined priority areas for Polish investments that include agriculture, tourism, oil and chemical industry, and techno parks. Aliyev, who is also a co-chair of the commission informed the Polish side about economic potential of the country, and large international and regional projects implemented in the country, particularly North-South Project, East-West Transport Corridor and Baku-Tbilisi-Kars railway project. During his visit, the minister held meetings with Polish co-chair of the Commission, Deputy Prime Minister Mateusz Morawiecki, Energy Minister Krzysztof Tchorzewski and other officials. A number of bilateral business meetings were also held within the gathering of the Commission. SOCAR Trading, the biggest supplier of Azeri Light crude oil in the world, and Polish Lotos Oil Company reached an agreement on the transshipment of liquefied petroleum gas (LPG – propane and butane) and liquefied natural gas (LNG) within the meeting. 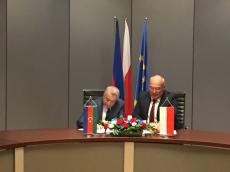 The agreement envisages deliveries of crude oil to Poland, as well as supplies of LPG and LNG to marine terminals in Gdansk. Moreover, SOCAR representatives held discussions on Sarmatia project with Polish counterparts. Participants of Sarmatia are the State Oil Company of Azerbaijan (SOCAR), Georgian Oil and Gas Corporation Ltd (GOGC), Ukrainian UkrTransNafta, Polish Przedsiebiorstwo Eksploatacji Rurociagow Naftowych Przyjazn SA and Lithuanian AB Klaipedos Nafta. The trade turnover between Azerbaijan and Poland amounted to $55.76 million in January –September 2016, with some $51.31 million falling to a share of import of Polish production.